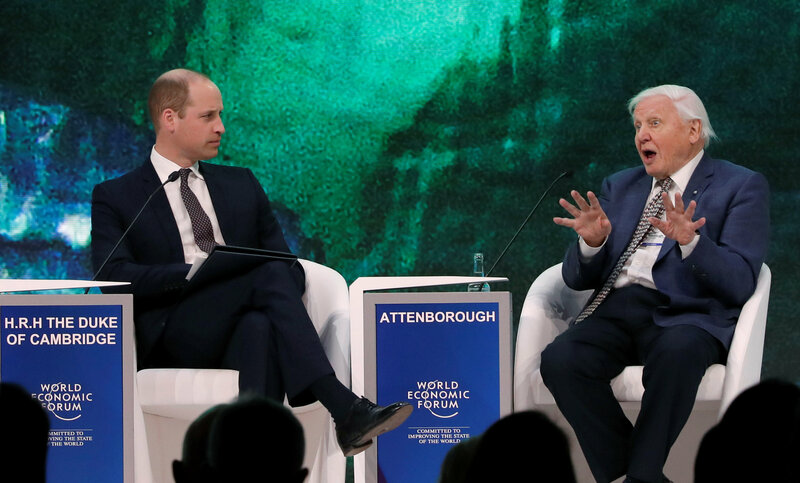 Britain's Prince William turned interviewer at the World Economic Forum in Switzerland on Tuesday, quizzing TV naturalist Sir David Attenborough on what he called world leaders' "faltering" steps to tackle environmental challenges. "Normally I have to endure people asking me questions so it's quite nice to be able to turn the tables for once," William, who is second in line to the throne, joked to the 92-year-old TV broadcaster in Davos. Attenborough, whose natural history programmes include Blue Planet II and Dynasties, said it was difficult to overstate how urgent the climate crisis had become. "We are now so numerous, so powerful, so all-pervasive…that we can actually exterminate whole ecosystems without even noticing it," said Attenborough, who was born weeks apart from William's grandmother, Queen Elizabeth II. He hailed the 2015 Paris climate agreement as a point where world leaders had recognised the dangers of rising temperatures but noted this had not been universal. "There have been people who have withdrawn from that," he said. Speaking last month on the sidelines of United Nations climate talks in Poland, Attenborough told Reuters that US President Donald Trump was "out on a limb" in his attitude to climate change. "We can wreck it with ease. We can wreck it without even noticing we're doing it. And if we wreck the natural world, in the end, we wreck ourselves." During the forum’s Crystal Awards on Monday, where he was honoured for his environmental stewardship, Attenborough warned that "the Garden of Eden is no more." On stage with William, there were lighter-hearted moments. The former air ambulance pilot met Attenborough's praise of a helicopter pilot who helped achieve a camera shot for his new Netflix documentary series Our Planet, by remarking "all helicopter pilots are very skillful, David."